This potable charcoal grill has legs and wheels for easy transport. The bowl and hood have temperature controlling vents. It features wooden handles and knobs, which are heat resistant. The grill comes with 3 position cooking grid grills for better cooking. The 342-square-inches of nickel plated grilling surface and elevated fire grate are able to resist corrosion and rust. It has a 90 days warranty. The product features a new idea of two side folding wooden tables. They provide with extra usable space to keep your plates, spices, meat cuts or whatever you use while cooking, and are very convenient. With this grill, you can save cost on charcoal. It comes with adjustable vents to snuff out charcoal to be used for next time. The heat resistant wooden knobs and handles provide safety from burns, so you don’t have to worry about accidents while working. To prevent any burnouts of the surface you are working on, the ash dump and fire grate are elevated above the ground level. With an adjustable top grate, you can use it for cooking with a variety of grilling techniques ranging from roasting jalapenos to searing steak. The ash pan and the grill are easy to clean up when you are done and don’t require much effort. The assembly of the charcoal grill can be cumbersome and tiring. With nuts and bolts, you might need technical help for putting together the hardware. You might even find the assembly directions to be vague. The red paint might not with-stand the hot temperatures and may consequently burn off with the passage of time. The metal is rather built with a cheaper and lighter material, though it isn’t very heavy. Some users might find the attaching and removing of the hinged top somewhat difficult. With some technical help and focused time, you can assemble the grill in a few hours. But once assembled, you can easily take it with you to your outdoor family reunions, picnics and trips. 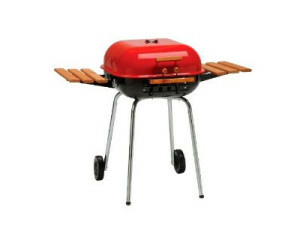 The grill is light-weight, inexpensive, has excellent grilling features and equipment and is a great value for money.